I am an RDI Program Certified Consultant in the Dallas/Fort Worth, Texas area, serving local families in the metroplex; and distance families around the country and world. I help parents learn to guide their neurologically vulnerable children using the RDI Family Consultation Program, which is a unique, evidence-based training and supervision program. I work one-on-one with parents using the RDI curriculum, meeting regularly in person or on skype, and I also review the detailed video parents provide, which document the progress in goals for themselves and their child. Below is an interview I did in the summer of 2014, so you can learn more about me. A version of this interview first appeared in the RDIconnect Newsletter, where I was the Featured Consultant. I started out life as the daughter of a concert pianist mom (my father having passed away when I was a baby) so performance was in my genes. I got into radio/TV early in college and worked as on-air talent for morning shows, as a news reporter, etc. When my youngest child, Daniel, was 2, (now age 21) he was diagnosed with autism spectrum disorder and it rocked our world sideways. I'd just said 'no' to a General Manager position at a local radio station in Dallas because I wanted to be home part-time with my children. I had subsequently been laid off for that decision, so I was looking to be back in radio somewhere else. But of course, the importance of that fell away after that day of the diagnosis. How long have you been a consultant? What made you want to become a consultant? After the diagnosis, Bryan (my husband) and I both started working with Daniel through our ABA program in the home and our lives became dedicated to making sure we did every thing we could for Daniel, and that our older child, Ruth, grew up with what she needed. We had wonderful people around us always–therapists, consultants–wonderful mentors really. But as parents, we wanted to be completely hands-on. We considered it our responsibility. We saw a lot of progress and though Daniel had many obstacles, he continued to improve. But there were missing pieces. Many of them. By the time RDI was on the scene, my son was 10. I was used to hearing about amazing treatments that were going to make him "recovered." So I thought this was the latest. I'd seen so many friends hurt and disappointed by shots, diets and some really 'out-there' things. They were desperate. But when professionals I respected said "you need to check this RDI out," I knew I must. I was working as an ABA therapist at the time and went down to the RDI professional workshop. I was blown away in the first hour. A program with a focus on parents as the main guides? "Where have you been all my life?" I thought. And the student goals? They were a missing piece for my son. I realized there were LOTS of missing pieces. One of the biggest missing pieces had to do with my son's lack of "experience-sharing." RDI changed our relationship. 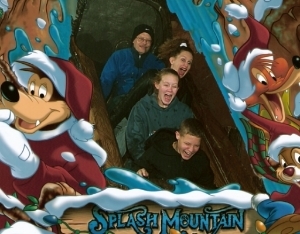 I remember one time we were at Disneyland and we had just gotten onto the Splash Mountain ride. We were going up the part before you're plunged into the deepest, darkest water. He was in the front; I was sitting behind him. My son actually turned right around to look at me, with much anticipatory glee on his face, communicating "OH MY GOSH!" because he truly wanted to share that experience with me. He didn't have to turn around, but he felt an internal need of his own to connect with me. I could never MAKE him want to do that, and it's not something that I could have "taught" him, like I was able to teach him colors or shapes. It had to be a process where that was just a natural outcome for him, and that is what RDI does. It helps parents learn how to guide their child step-by-step, back onto the developmental path where these sorts of outcomes just become inevitable. Can you recall an experience that stands out for a family you've worked with? I worked with a little boy who had come so far in his journey. As long as he was in charge, he was competent and charming. But he could not be in the apprentice (learner's) role. He did not know how to be. And because of this, despite all his skills, he was not progressing in his relationships. He could lead his mom in a complicated drum pattern. But he could not follow her lead at all. If he was in charge, we were golden. If not, he fell off a relational cliff. Of course, this cut him off from peers and others. What a difference RDI® and our model of parent-led guiding made for him. I can tell that you are a very creative person, how has this influenced your work with RDI®? You might be surprised that I don't consider myself creative. But I do have a vision for my son and the children I see. So I take that vision and use it. If there is any creativity, the vision is the source. I think that finding hope not in what is but what can be is very important. We will only stay in one place if we can't see ourselves in another. What do you wish to see for the future of Autism therapies? Sooooooo many things. But most of all, parent involvement. We know that the children with the best outcomes have the parents that are on the floor playing with them, guiding them, helping them learn to learn, passing on what they as parents know. This is true for all children and it applies to children with ASD too. We cannot hand our children over to someone else to "fix" them. We end up with heartbreak if we do that. But we as parents need patient, thorough training and supervision. And that is what RDI has to offer. RDI is a family program and the lives that are changed by parent empowerment motivates me every day. When parents feel empowered, their children benefit. What is one piece of advice you would want to tell every parent who has had a child diagnosed with an autism spectrum disorder? Whatever you decide to do for your child, be hands-on, be an active part–don't hand your child over to others and hope your child comes back to you well. You will have others help you, but you have to be a collaborative, active partner in the process and you must become a trained guide for your child to achieve his or her best outcome. While other professionals can love your child as many professionals will, none of them will have the level of investment that you have, as a parent. Can you tell us a little about the “Coffee with Kat” Webinars you are offering through RDIconnect, for any parent currently involved in an RDI Program? Yes, I want to visit as a parent, with parents so we can talk about our concerns, our issues, our obstacles. I hope to address topics that are relevant to us as parents in our everyday lives. For example, a recent coffee chat was about activities and as every parent knows, we can get a mental block when it comes to "what to do." The webinars are recorded and archived so they can be viewed later by parents who are unable to attend. Going on dates with my husband! When we were newly together (29 years ago), I was working in radio; he was working as a geologist and sitting wells. I was always working: early mornings, late evenings, 6 days a week was normal, 7 not unusual. We had to schedule dates together then. No matter what was going on, we scheduled a date once a week. We did this after we were married because we knew, especially with my work, that we would not get to spend time together if we did not plan it. When we had children, we maintained our weekly dates. When our son got diagnosed, time together became even more scarce and we continued to try to get at least a 30-minute date in a week. When I say date I'm just talking about having time alone together out...it might be coffee at McDonalds. Evenings, we had very little time alone. Honestly, we had to fight for that time together. Because of that, I really value the time we do get together. It is still challenging because we still have many obstacles but I don't take time with him for granted. I have been actively involved in many local autism groups, including 6 years as President of FEAT (Families for Effective Autism Treatment) North Texas; Consumer Chair of the Texas Association of Behavioral Analysis (ABA) Autism SIG; and Consumer Representative of the Texas ABA SIG. Because your name is Kat, how do you feel about cats? I love cats. I've always owned a cat. Right now I have three: Baby, Queen Nefertiti, and Spot (because Spot is like a dog and follows me everywhere). My husband may love cats more than me, which is why I KNEW he was the ONE.